Ever wondered what it’s like to train for a marathon? Our blogger, Rachel Glum, invites you along for the ride as she takes on her second marathon, this time with a shiny new time goal. Read on as she reflects on the first 6 weeks of training, why she did two long runs in one week, and when it’s ok to skip a long run. 6 weeks of training down, 16 to go. On the one hand, it’s crazy how fast it’s going, but then I realize I’ve still got almost 4 months of training to go. I’ve always been fascinated at how time seems to pass both very slowly and lightning fast during training; I swear it feels like I live an entire lifetime during a 2 ½ hour long run, yet focusing so completely on each individual run somehow seems to make the weeks fly by. And how is my speed progressing? I’ve been consistently doing two interval speed workouts per week. One workout currently consists mainly of longer intervals of 1-2 miles at marathon pace, while the other consists of shorter intervals at sub-marathon pace. Two long runs in one week? Week 5’s long run was a bit of an adventure. With a visit to see my family on the agenda, I planned to complete my 12-mile run on Saturday morning as usual. Despite the forecasted hot, humid weather, a shaded bike path nearby would provide a pleasant path. However, late nights and a poor night’s sleep on both Friday and Saturday night meant that I didn’t feel prepared for a long run either morning. I could have given up on my long run for that week. Instead, I got up extra early on Monday morning before work to get my 12 miles in. Due to an error in planning the route, I actually ended up trekking over 13 miles in less time than my most recent half marathon. It felt pretty amazing having accomplished that before the work day even started on Monday! 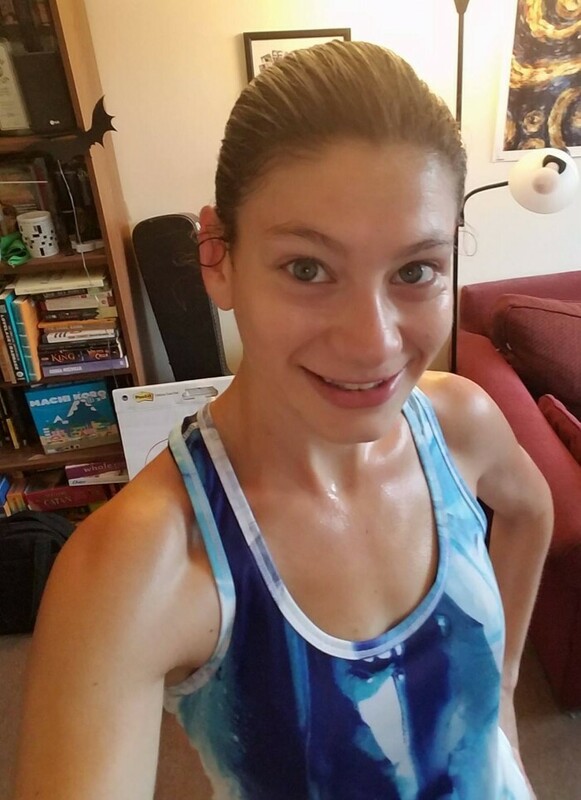 I was extra sore for the rest of the week due to that delayed long run, but by the time Saturday rolled around, I felt pretty normal again, and was able to get in a successful 15 mile run without too much trouble. To be honest, the prospect of skipping a long run really upset me, and made me feel like I was failing. Perhaps I’m too hard on myself at times, but I’m really glad that I didn’t let my weekend away de-rail my training, and that I found a way to not skip any workouts. Cheers to a double long-run week! Topic of the week: When is it ok to skip a workout? Sometimes it’s ok to skip a workout in favor of catching up on sleep. I also think it’s ok to delay a run to a day when you’ll be better rested. After I get a night or two of bad sleep, running feels much harder, I’m a lot more prone to getting sick, and my motivation plummets. Successful marathon training isn’t just about running – It’s about running, sleeping well, hydrating, fueling with healthy food, cross-training, developing mental endurance, managing stress, and more. Taking all these aspects into account will help you recover faster, maintain a positive attitude, and actually enjoy training, rather than burning out by the end. Sometimes it might be worth it to skip a run or re-arrange your workout schedule to benefit one of these other aspects. What about when you’re sick? If you have a cold, it’s generally safe to run, so assess based on how you feel. If you’re feeling unusually tired or are very congested, skip the run and catch up on some sleep. Otherwise, venture out cautiously and be ok with slowing your pace or cutting the run short if it doesn’t feel right. If you have a more serious illness, it’s best to stop running and focus on recovering. Continuing to run will only prolong how long you feel under the weather. And speaking of weather…if you train in the summer, it might be best to forgo a run if the temperature and humidity reach dangerous highs. The risk of developing heat exhaustion or even heat stroke increases significantly when the heat index reaches 91 or higher. Safety first, my friends! And finally, do not run if you get injured. Getting injured while training can be very frustrating, but you’ll only make the injury worse by continuing to run. Often, these injuries are due to overuse or increasing training volume too quickly, so it’s essential to rest if you want to recover. When you feel that you’re doing better, ease back in slowly, and stop running if the pain returns. When you’re in the middle of training, it can be difficult to distinguish between soreness, mild illness, or fatigue that you can push through and what you can’t, but the more experience you have, the better you’ll learn to listen to your body.